Discipleship is a hot and widely discussed topic in the church today. That’s good, because if someone thinks they have a unique message from God—they probably don’t. When God wants to bring about change, His normal practice is to put that idea into the hearts and minds of thousands and tens of thousands of his children. For that reason, it is encouraging to see so many leaders taking discipleship seriously. But just exactly what is discipleship? Is it a program? Is it a curriculum? Programs and curricula are great tools for helping people understand what it means to become a disciple of Jesus. They are great ways to train people how to make disciples. We need programs and curricula, but discipleship is more about helping real people with real problems who need real “good news.” So it’s helpful to distinguish between the means and ends of discipleship. Programs and curricula are some of the means. Bringing people to faith in Jesus and spiritual maturity are the ends. But making mature disciples doesn’t happen overnight. In our last post, we discussed three conditions that, if met, qualify a person to be counted as a disciple. We said that a disciple is called to walk with Christ, equipped to live like Christ, and sent to work for Christ. The reverse is also true…if these three conditions are not present in a person’s life, the person is not truly a disciple of Jesus (See: Matt. 7:21-23, Matt. 13:1-9,18-23). 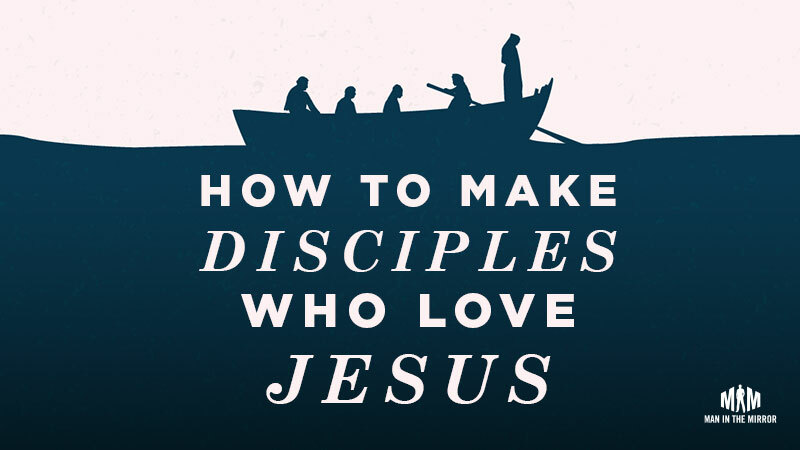 So, what does discipleship—the act of making disciples—look like? First, a disciple is someone who has belief in Jesus, His life, work, death, and resurrection. Thus, the first task of discipleship is evangelism—to call men to walk with Christ by grace through faith. A lot of people who reject Christianity see Christians and say, “If that’s what it means to be a Christian, then I want no part of it.” Isn’t that a criticism too dangerous to leave unanswered? It may do more harm than good to invite a man to become a Christian if we have no plan to help him truly know and follow Christ. The second task of making disciples is teaching—to equip them to live like Christ. When we don’t disciple (train and equip) a man who professes Christ, he will almost always become lukewarm in faith, worldly in behavior, and hypocritical in witness. Why do we equip men to live like Christ? So they can enjoy Christ by knowing Him better, but also “so that the man of God may be thoroughly equipped for every good work” (2 Timothy 3:16-17). Jesus prayed, “As the father has sent me, I am sending you” (John 20:21). Every man wants to give his life to a cause, to make a difference, to do something with his life. When we disciple a man, he will eventually want to make a difference for the glory of God: to “bear much fruit” and do good works “that will last” (John 15:8, 16). The third task of making disciples is moving men toward service and missions—sending men to work for Christ, to build His kingdom and bring Him glory. Once a man has been with Christ, experienced the joy of His grace, the warmth of His love, the cleansing of His forgiveness, and the indwelling of His Spirit, he inevitably comes to a point when he can no longer be happy unless he is serving the Lord. Understanding the task ahead of us, how do we go about accomplishing it in a man’s life? In our experience working with churches, the most meaningful change takes place in the context of relationships. As we said in the previous post, men were made for relationships. We tend to bond in shared experiences, versus shared conversations, and there’s a definite progression. You can see it in the way that Jesus built a seemingly random group of strangers into a band of brothers ready to die for their cause. With thanks to a pastor friend of ours, here is a helpful description for what a discipling relationship looks like: Intentional Spiritual Friendship. Intentional – Important relationships take work. They aren’t casual relationships with people we see every day in the office or in class. It might take three or four times inviting a guy to coffee or an church event before he finally agrees to go. Spiritual – Many of us have friends that we enjoy spending time with, playing golf or getting our kids together. But we may never talk with them about our walk with God or struggles in our marriage. In a discipling relationship, you are giving another man the freedom to ask tough questions and hold you accountable. Friendship – Jesus’ disciples shared life together. They broke bread together in each other’s homes. They enjoyed being around one another on a daily basis. Discipleship cannot be forced—it’s okay if you cannot seem to get along with someone despite your best efforts. If we want to create a sustainable disciple-making culture in our churches, we will focus our ministry resources, time, and energy around fostering intentional spiritual friendships. This is how we help real people with real problems in a way that no program, curriculum, or strategy by itself can. The Big Idea: In order to make disciples who love Jesus, we need to develop intentional spiritual friendships with other men. If you are enjoying this blog and finding it helpful, why not subscribe below so you don’t miss the next one? We are going to continue diving deeper into the No Man Left Behind model, and how it helps leaders build and sustain a thriving disciple-making ministry for every man in their church.